With the amount of tea I consume on a daily basis it shouldn’t come to as a surprise to you blog reader that I am no stranger to teeth whitening products. 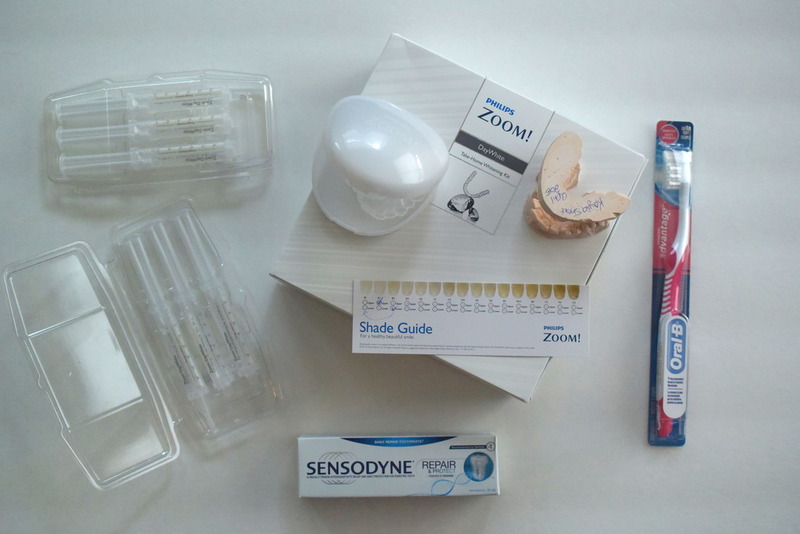 I haven’t however (until now), tried Zoom Whitening before, which is a professional line of teeth whitening that is offered by dentist professionals. In the past I’ve used mostly the Crest products, and few Colgate toothpastes (the one in the red box “optic white” is actually pretty good). 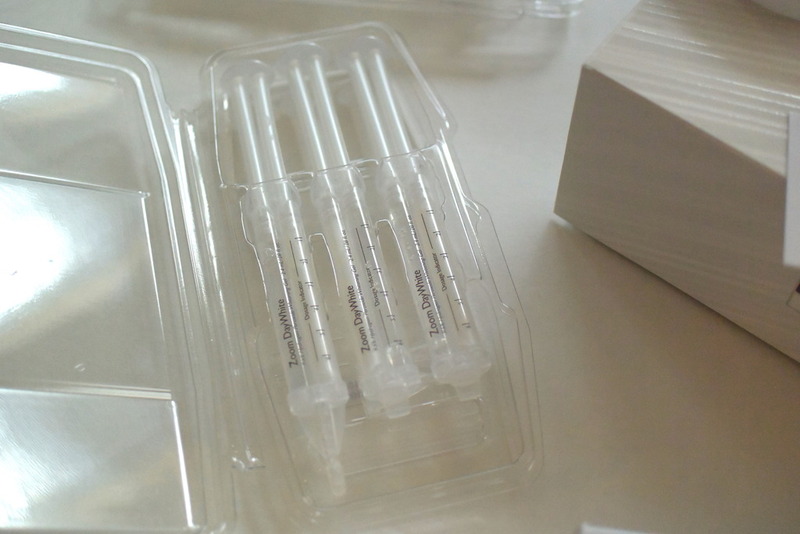 As good as the over-the-counter products are nothing compares to having your own custom made trays (super precise application), a professional strength solution, and the guidance of a professional. If you’ve whitened your teeth before you know that it’s important to start with SUPER clean teeth, so if you can schedule a professional cleaning prior to whitening this would give you the best results (makes sense right?). Lawen Dentistry also suggests that you should also make sure to get a new tooth brush you don’t want any of the old junk messing up your new pearly whites. You might also want to consider a sensitive tooth paste (avoid whitening ones while using the kit) just in case you get a little sensitivity from the bleaching product. This is common and can be expected, but sensitivity ranges in terms of severity. For more whitening facts make sure to visit the Phillips Zoom website there’s plenty of information under the “Whitening 101” section. I didn’t realize this, but I guess my teeth we already pretty white (according to the little chart), but my bottom teeth were not as white as the top (which I guess is common because of your bottom lip being so close to them build up can occur). 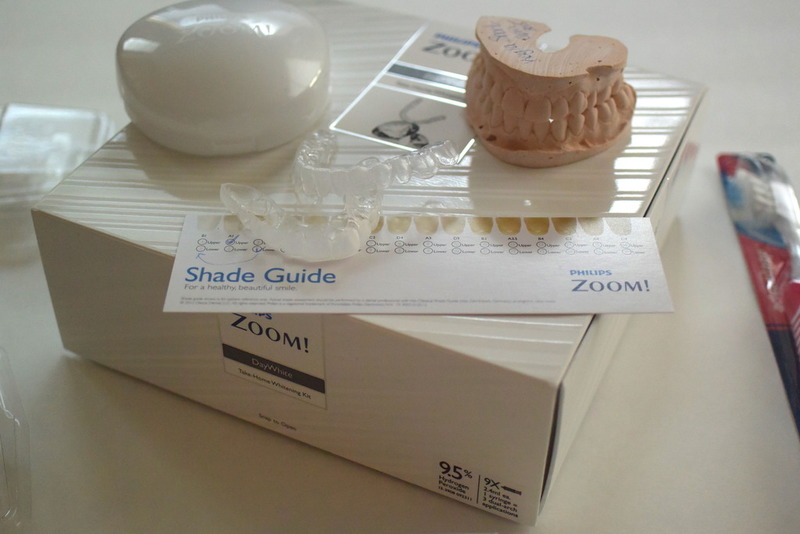 Our goal with the zoom whitening at Lawen was to get both sets to match each other. 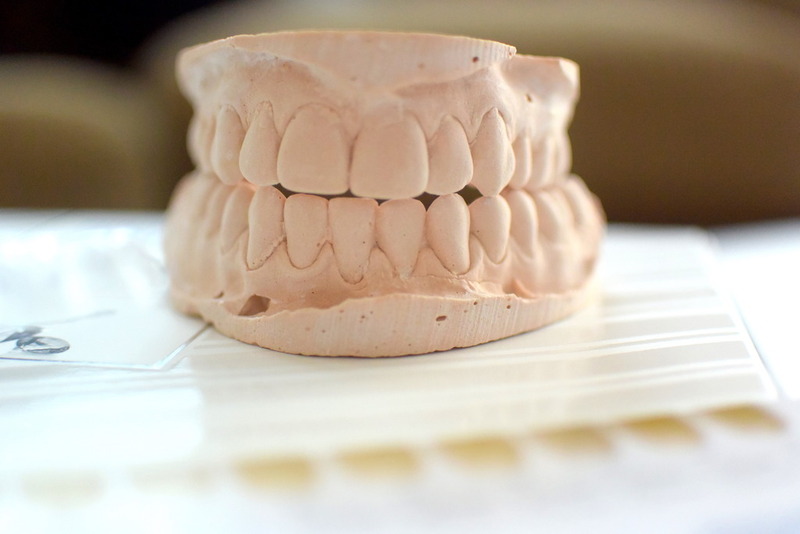 Speaking of custom trays, while getting my impressions done the woman who was doing them (she was super adorable I wish I could remember her name) was shocked with how small my mouth was! I told her she should tell my mother haha because growing up with me as a teenager she might disagree 🙂 Anyways when she did my impressions she had to use the child size trays (insert embarrassed monkey emoji), and when I came back to pick up my trays she told me that she didn’t think I fully grasped how small my mouth was, so she made me a little mold. She then showed me another grown up mold, and mine completely fit inside it. We had to laugh, I just could believe it! No wonder I had to get braces as a teenager with these baby chompers. Okay so jokes aside, are you excited blog reader? 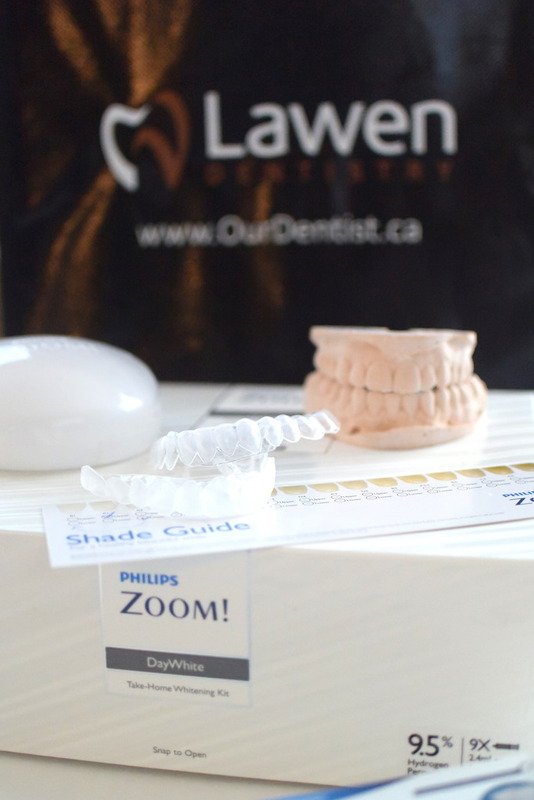 Because one of you local lovelies can try out a Zoom Whitening kit for yourself (retail Value $175) with today’s giveaway from Lawen Dentistry. impressions that must be done in Halifax NS. Happy Teeth Whitening Blog Reader! *First photo c/o Matt Corkum Fade to White Photography. All other photos were taken using the Nikon 1 J4. The standard bracelet on the Rolex Submariner is replica watches patented oyster bracelet featuring a flip-lock clasp to insure that watch does not dislodge while being worn. In addition, the bracelet features a diver’s extension that unfolds as needed for use on the wrist when wearing a wet suit. The hublot replica sale is guaranteed by Rolex to a pressure proof depth of 300 meters or 1000 feet. The Rolex Submariner also features a revolving time elapse bezel that can only be turned counter-clock wise. The use of the rotating Submariner bezel offers additional security during the various stages of the dive. In the year 2001 Rolex made a change to rolex replica sale Submariner bracelet by switching to the Solid End Link bracelet. This change made for a more durable and sturdy connection with the bracelet of the watch to the case. In the year 2004 Rolex went from having wholes on the side of the case for the pins to connect to the case and in the year 2004 Rolex removed the pins wholes from the side of the case, thus dealers now refer to chanel replica sale made after the year 2004 as the “no wholes case”. Also in the year 2004 Rolex launched its anniversary edition Rolex Green Bezel Submariner watch, model number 16610 LV. No strucutural changes appeared with the introduction of this new Rolex Submariner only minor cosmetic changes appeared. The two cosmetic changes were the dial markers and the color of the bezel insert which changed from green to black. Until the year tag heuer replica sale only made its Submariner watch with the black dial and black bezel insert. Rolex has three types of Submariners, stainless steel, stainless steel and 18k yellow gold, and all 18k yellow gold. In their 2tone and all gold models rolex replica uk has a blue colored bezel and dia.